Taco Heat Motor Zone Valves provide a convenient way to create individual zones or equipment isolation in a hydronic heating system. Utilizing one pump along with multiple zone valves, flow can be started, stopped or diverted through the system to provide individual room or area comfort control and energy savings. 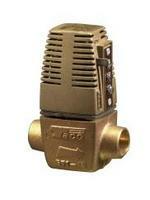 The Gold Series is the industry standard for hydronic heating applications. The quiet and dependable operation has made this valve an industry leader for decades. The manual open lever and twist off head makes installation and service easy. Available in 1/2" and 3/4".